04 Nov PDO, PGI, IDO – What is this? PDO Wines of Greece (“Protected Designation of Origin”) include the Greek wine category of “Designation of Origin Wines” (AOQS and AOC). 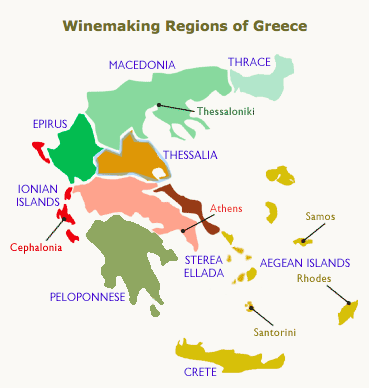 The areas where AOQS wines are produced – “Designation of Origin of Superior Quality” (part of the PDO Wines of Greece) are in essence the historical winegrowing and winemaking areas of Greece. In those areas, winegrowing zones determined on the basis of the borders of communal municipalities have been established, together with certain restrictions regarding altitudes or natural and artificial limits. With the exception of two areas, varietal compositions are determined strictly on the basis of Greek native grape varieties. All zones are subject to restrictions as to the maximum allowable yields per 0.1 hectare and various other prerequisites which wines must comply with. Especially AOQS wines, which carry a mandatory characteristic red band on the neck of their bottles, must be produced by wineries located within their winegrowing zone. In other words, it is not only the grapes which must originate within a certain zone: the wineries vinifying them must be established within that zone as well. • By addition of alcohol originating in wine (previously fortified wines – currently liqueur wines). Such wines are characterized as “vin doux naturel”. The use of alcohol in their vinifications gives them the designation of “controlled” wines. • By concentration of the grape contents through various natural techniques (over-maturation on the vine stock; exposure to the sun (sun-dried grapes); sun-drying; or air-drying following the harvest). These wines bear the characterization of “vin naturellement doux”. Should the grapes yielding these wines have been sun-dried prior to vinification, the wines are also entitled to being characterized as “straw wines” or “vin liastos”. No additional sweetening is allowed through the addition of must, concentrated or not, or through the addition of alcohol or any distillate. PDO Wines of Greece (AOQS and AOC) are required to display certain indications and other information on their labels. These concern aging times (oxidized aging in oak barrels and fermentation in bottles) as well as details of the winegrowing entity producing them. In the popular zones of PDO Wines of Greece (AOQS and AOC) provisions allow aging in oak barrels (with the exception of the PDO Santorini and PDO Monemvassia-Malvasia zones); bottling (except PDO Monemvassia-Malvasia) and bottle fermentation also in wineries located outside the zones. Thus, PDO Wines of Greece (AOQS and AOC) are also produced by wineries outside the zones that collaborate with wineries within them. The PDO Wines of Greece are: PDO Anchialos; PDO Amynteo; PDO Archanes; PDO Goumenissa; PDO Dafnes; PDO Zitsa; PDO Lemnos; PDO Mantinia; PDO Mavrodaphne of Cephalonia; PDO Mavrodaphne of Patras; PDO Messenikola; PDO Monemvassia-Malvasia; PDO Muscat of Cephalonia; PDO Muscat of Lemnos; PDO Muscat of Patras; PDO Muscat of Rio Patras; PDO Muscat of Rhodes; PDO Naoussa; PDO Nemea ; PDO Paros ; PDO Patras; PDO Peza; PDO Slopes of Meliton; PDO Rapsani; PDO Rhodes; PDO Robola of Cephalonia; PDO Samos; PDO Santorini; and PDO Sitia. (Identification of Designation of Origin)Τhe phenomenon of certain wines becoming well-known or even famous and much sought after because of their place of origin (designation of origin) is not an uncommon one in Greece and dates back to antiquity. It has in fact been substantiated that, in ancient times, the authenticity of those wines was safeguarded through a variety of means; archeological finds and historical as well as archival sources corroborate this fact. Ariousios oenos from Chios; Thasios from Thassos; Maronios or Maronitis from Ismaros and Pramnios from Ikaria are but a few of the sought-after wines of antiquity which bore a designation of origin, as ancient texts confirm. At the same time, inscriptions, seals, and other archeological finds such as sealed amphorae from Rhodes found scattered around the Mediterranean basin, also confirm that the ancient Greeks (as well as others) wanted to make certain that the wines they procured were authentic. The concept of terroir may well be one expressing authenticity. However, at the same time, it also expresses a wine’s typicality: In other words, it expresses the sum of determinants which are necessary for wines bearing a designation of origin and which are recognizable and repeated from year to year. • Topography (altitude; orientation and exposure to sunlight; ground inclination, etc) and the soil’s chemical composition. • The area’s macro- and meso-climate and its development from year to year. • The grape varieties cultivated. • The winegrowing and winemaking tradition of the area and the corresponding cultivation and vinification practices applied. • The people themselves who maintain and develop the area’s winegrowing tradition.